The Philadelphia Zoo, opened in 1874, is the first zoo in the United States. 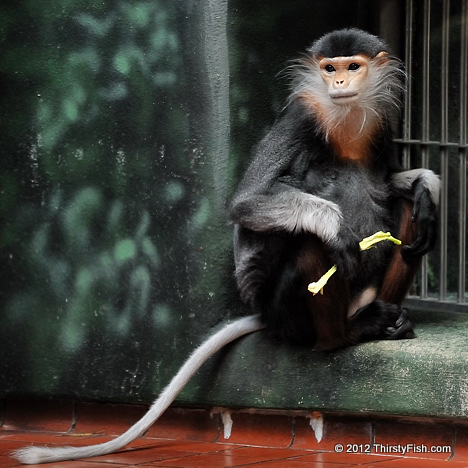 It is home to over 1,300 animals, some of them rare and endangered, like the Red-shanked Douc pictured above. The Red-shanked Douc Langur is an Old World monkey, native to Southeast Asia, specifically Cambodia, China, Laos and Vietnam. It is among the most colorful of all primates. It is diurnal and feeds mostly on leaves. A social animal, Doucs feed together without quarreling, and they can be observed serving each other food. Their main predator is humans and they are hunted for food and for body parts used in traditional medicine! The Douc Langur is threatened throughout its range by habitat destruction and hunting. It is on the IUCN Red List of endangered species. From a cultural and evolutionary point of view, I'm not sure that human beings are "special". We slaughter the Douc Langur to manufacture medicines we do not know to work. We slaughter birds with beautiful plumes to make hats. We slaughter each other because we have different beliefs, or because the color of our skins differ. Some of the same beliefs that give us the meaning of our lives, also diminish the meaning in our lives. Unless we overcome the kitsch and achieve wisdom, we will never be "special" - we will continue to be primates.